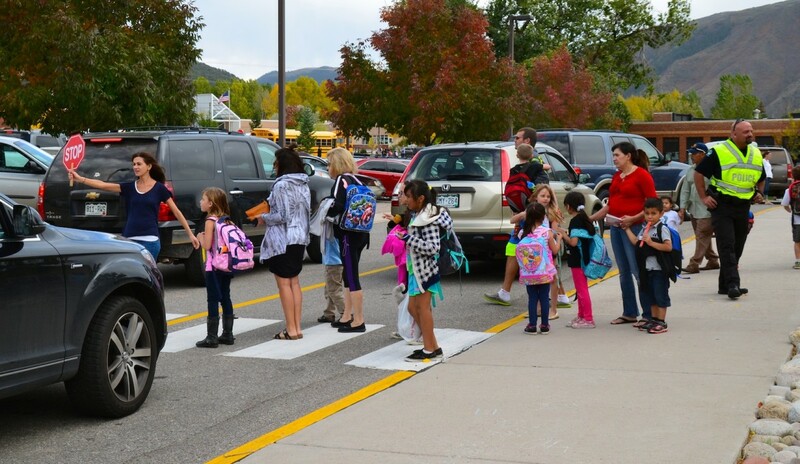 After-school traffic congestion is a perennial problem at Basalt Elementary School, so an overhaul of the parking area and a relocation of the adjacent bus corral are part of the Roaring Fork School District's $122 million bond proposal. 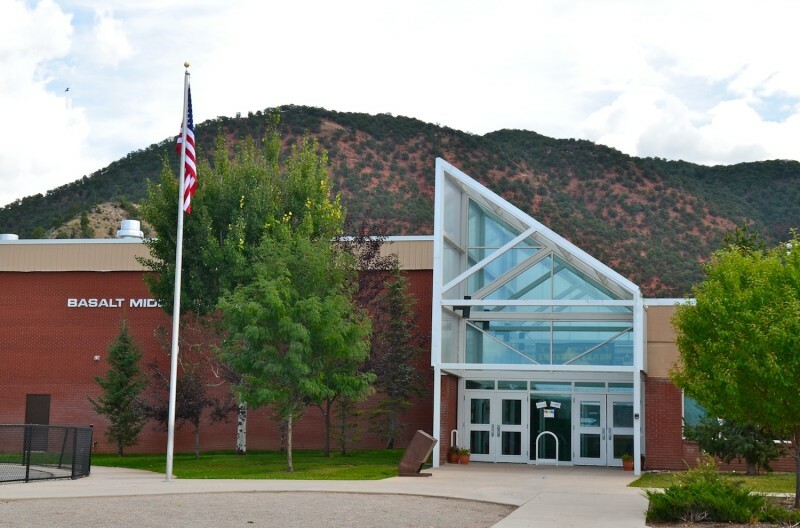 The Roaring Fork School District’s $122 million bond proposal offers great promise for downvalley schools but also poses political challenges. Both sides of this dynamic were on display in a Oct. 1 public forum at the Basalt Regional Library. Though sparsely attended — between 15 and 20 members of the public showed up, along with district employees and members of the media — the meeting revealed a spectrum of opinions about the ambitious proposal on the Nov. 3 ballot. District officials began the evening by outlining the yearlong process that led to Question 3B. Community meetings attracted some 200 participants, and a design team of 42 parents, district staffers and community members identified a total of $170 million to $190 million in capital needs. Using a PowerPoint slideshow with photos, graphics and numbers, school representatives made a compelling case to ease the overcrowding in the hallways, update their 40-year-old middle schools, create rental housing to retain employees and invest in new land and buildings for a growing population of children. “It’s really time to take a look at how the face of education has changed and how our facilities need to change,” Superintendent Diana Sirko said. Of course, it takes money to build 21st-century, energy-efficient schools, to create 15 to 20 housing units in each of the district’s three communities (Basalt, Carbondale and Glenwood Springs), to consolidate bus maintenance facilities and create new, secure school entryways in the post-Columbine era. To pay off a $122 million loan, the district is asking voters to raise their property taxes by $55 for every $100,000 of assessed value. Commercial property owners would pay even more: $204 for every $100,000 of value. The increase would be in place for 20 years. “It’s a big bill,” remarked one skeptical resident, who identified herself only as Barbara. On the other hand, said another audience member, upgrading local public schools maintains property values and promotes a healthy community. “I think vibrant schools make a vibrant community, and here is one opportunity to invest in our children and our schools,” said Ellen Freedman of Basalt. Basalt Middle School is scheduled for a major renovation under the Roaring Fork School District bond proposal on the Nov. 3 ballot. First opened in 1975, the building served as Basalt's high school till 1996. School officials acknowledged the impact of the bond measure on local pocketbooks but emphasized their obligation to educate the valley’s children, regardless of changing demographics, economic circumstances and population swings. Furthermore, board member Karl Hanlon said, when Colorado school districts want to boost their revenue, their options are limited. While cities and towns can levy voter-approved sales taxes, schools and other special districts must ask for a property tax increase. “It’s a function of the way government is structured in Colorado,” Hanlon said. Other attendees expressed disappointment with the Roaring Fork district’s last bond issue in 2004, and how certain promised improvements were either botched or left undone. Board member Matt Hamilton replied that operational expenses such as teacher salaries come from a separate revenue stream, and Colorado districts are limited in how much they collect. Bond measures such as 3B can only be used for one-time capital improvements. The school officials said their construction plans have been vetted by teams of community members and designers, and that they went to the ballot box this year in order to avoid further increases in construction costs. Also, they want to take advantage of a $9 million grant from the state of Colorado to renovate Glenwood Springs Elementary School, which was built in the 1920s. Of the district’s three communities, Glenwood will see by far the largest investment if 3B is approved. However, school officials noted, the overall funding split from the district’s bond measures in 1993, 2004 and 2015 — 26.3 percent to Basalt, 28.1 percent to Carbondale and 45.6 percent to Glenwood — roughly reflects the student populations in each place. Aspen Journalism and The Aspen Times are collaborating on education coverage. The Times published this story on Oct. 3, 2015.